Bertrand Russell claimed to be driven by three great passions that drove his personal as well as his intellectual life: a longing for love, a quest for knowledge and a heart-rending pity for human suffering. His philosophical outlook, which took deep account of the science of his time, was nonetheless rooted in logic and empiricism. Russell's greatest efforts were made in epistemology - the search for the ultimate grounds of our knowledge about the world. How can we be certain that what we know is true? Where lies the certainty in our experience of the world? 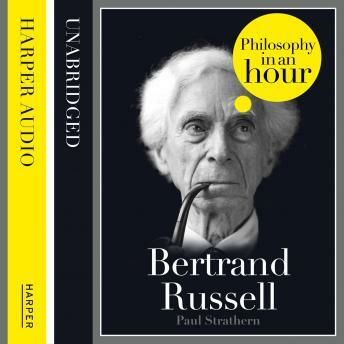 This audiobook is an expert account of Bertrand Russell's life and philosophical ideas - entertainingly written and is easy listening. Also included are selections from Bertrand Russell's work, suggested further reading, and chronologies that place Russell in the context of the broader scheme of philosophy.